For those of you over 5’5″ you are probably in a similar boat realizing that maybe rompers are not meant for you. For a couple of years I’ve had that thought. I see all kinds of cute ones on people but any that I had tried were just way too short in that it’s riding up you know where something fierce. 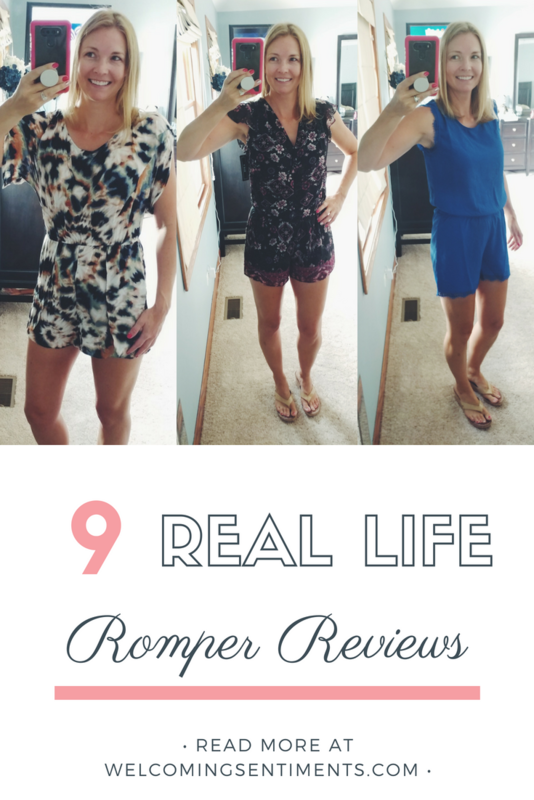 I spent too much time this summer shopping for and trying on rompers in hopes that I could find at least one that worked. Hopefully in this you can narrow down even further what may work for you. There were a couple that indicated the model in the online picture was 5’8″ or 5’9″ but they must have different proportions because those did not work for me. I could have a longer torso in relation to leg length of someone of similar height which could throw some of these off. If you know your you are all leg then maybe some that are too short for me would work for you. Disclaimer – some links may be affiliate links in that if you click on them and make a purchase at no additional cost to you I earn a small referral. First up are a couple from Nordstrom Rack. The State one shoulder romper in coral size 4. I loved the price point on this at just over $30. The information on Nordstrom Rack’s site indicated the model was 5’10” so I thought this would be perfect. It was too short and severely rode up. A caution also on this particular color is that it was extremely see through in the bottom. There was going to be no way of hiding anything. Skin colored underwear still showed as well as lines, even with a thong and it was way too thin to go without. Even if this was a great fit, it wouldn’t have worked for that reason. The shorts desperately need some kind of lining. The second one from Nordstrom Rack is the State V-neck Print romper. The model height is 5’8″ and on her it looks plenty big. This one was sooooo close to working. It fit great everywhere, using the proper undergarments the bottom was fine but it was just a little too short. I thought a lot about this one but ultimately decided that if I really needed to think about if it would bother me then it should be a no. The next bunch are all from Amazon Prime Wardrobe with all except one, it was just regular Amazon shopping. I’ve put them in order of what I liked the most to least and that’s not just indicative of fit. It’s overall feel, fit and look. They are all a size small. BCBGeneration Women’s Flutter Short Romper. I wasn’t crazy about the price on this ($88) but it is a full outfit, top and bottom and as you know due to the issues I have finding things that fit I sometimes just roll with it. This fit great, it’s not low cut in the top, it’s long enough and it’s not too thin. The only downside is that it ties in back up at the neck. If you can’t tie on your own behind your back you may struggle when you are in a public washroom…lol! A.Byer Juniors Short Sleeve Printed Wrap Front Romper. I really liked this one. At $34 the price was great. This was also lined, comfortable and pretty. The issue…you guessed it…too short. This might be ok for someone under 5’6″. This was another one that I really wanted to like. It was in my very first Amazon Prime Wardrobe box and you can read the full details on my previous post. In summary, lines, great price just way too short. Bright, pretty blue would be so versatile for dressing up or down. Another romper I really wanted to like. The Noisy May Women’s Mena Sleeveless Playsuit was just a regular Amazon purchase, not Prime Wardorbe. I did make sure to read the details on the return policy though and it had free returns. That is the only way I would order something like this from Amazon is knowing that it had a free return policy. If you’ve ever tried to return anything to Amazon it’s not a great process. Anyhow, the price on this ($65) wasn’t horrible and it was pretty. It was a good material and comfortable it was just too short. This would probably be good for anyone under 5’6″. The Olive & Oak Women’s Fiona Romper is a pretty casual print and for something so casual at $68 a little overpriced in my mind. It’s a pretty thin but comfortable material and not too see through with the proper undergarments. This again was just way too short. You may need to be under 5’5″ for this one. The O’Neill Junior’s Marcia Romper was cute, fit good but again just too short. I’m not one that is typically a fan of a deep v-neck but this actually had a lot of coverage and did not gape when bending over. If that style typically turns you away this one may still work if that’s the concern. Last but not least is another one from my first Prime Wardrobe (BCBGeneration Women’s Pirate Blouse Romper) which you can read more details in that post. The summary though is that this is more like a swim cover-up than real clothing. Most of these would be perfect if you are just a little shorter than I am. Happy shopping and hopefully you can find a romper quicker than me! Please leave me comments if you are on the taller side and have other suggestions or have found some that work for you.